I told him, “That is beside the point.” Even though, between you and me, it actually was on. But my statement wasn’t driven by a mood swing. It was more introspective. Sometimes I get reflective when things aren’t going my way. Those times when life feels like a constant uphill climb. I morbidly tend to wonder when all the struggling is going to be over. When will everything get a little easier? Not that I want to rush to my demise but my mind seems to sometimes drift in that direction. So when I find myself in that somber space, it comforts me to remember when my situation was worse than it is now. And I think about how far I’ve come. There was a time, after a bad exacerbation, I was in a medical center for a month. A two-week hospital stay and a two-week inpatient rehab stay. Back then my utmost concern was just making it through the day. I needed assistance with everything. When I finally went back home, I couldn’t even feed myself. And worst of all, no one knew how much of my lost abilities I would regain. So looking back at that moment in my life usually snaps me out of any pity party. But this time I remained somewhat tense. We both laughed. But secretly, I do hope he lives a long life. It’s because I want to die before him. Is that strange? I just can’t imagine being a big burden on anyone else. Don’t get me wrong my health is stable. I’m going to the gym as often as possible. I take my medication and I pray to the Universe for my well-being. And I understand at the end of the day, even if I don’t like my circumstances, it’s my responsibility to make the best of the life I’m blessed to have. Others aren’t so lucky. With a few exceptions, most of my life with MS has been a multitude of unpredictable inconveniences. But it’s not deadly. 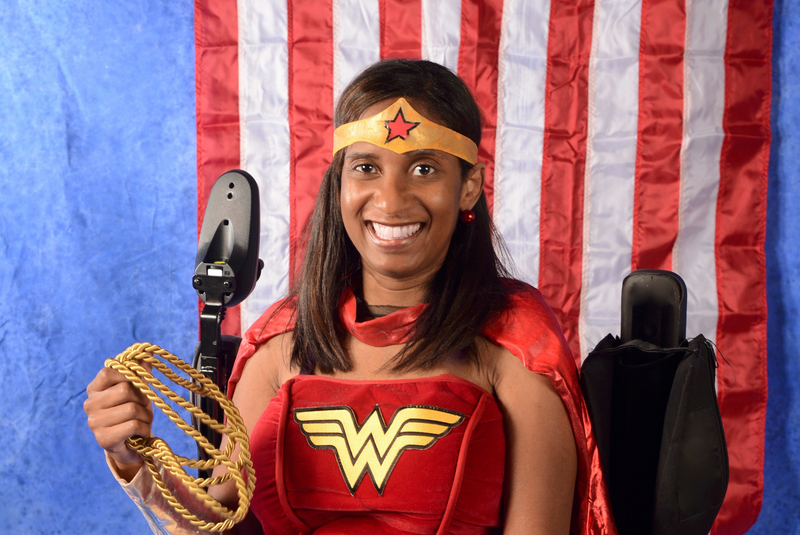 And I answered back, “If that’s true, people with MS must be superheroes. Thanks I enjoyed this very much! I’m newly diagnosed 3 weeks ago and I recently described my symptoms as if there was eletricity building in my right arm and ready to bust out a superpower at my fingertips! Then I sarcastically stated if that’s the case maybe MS is worth it! What doesn’t kill me might make me stronger, but it also makes me really tired. You are rocking that outfit into the universe! You go girl!! Love your Super Hero picture! And glad to know that Tommy plans live for another 100 years or so! You are my hero. I printed your picture, framed it and put it next to the chair I spend so mch of my day in to remind me to make the most of every day I have in spite of the day’s circumstances. I feel so much love, respect, and appreciation for having you in my MS life. Thanks for sharing your considerable talent for being able to put into words the feelings others fighting MS are not able to express. I know exactly what you mean. And, by the way, we are stronger than any boxer or wrestler because LIFE has tested us more. And we are winning the strength contest! Hi Cathy, I agree we are stronger and also, we are fighters!!!! Nicole, you ARE a superhero. You are one of the strongest people that I know. I love you and hope you live to be a 150 too. Going through an MS Exasperation now and really needed to read something like this, for now, my spirit is uplifted. You are a super hero! Thank you for your words and keep being strong because your strength carries.